Bentley was adopted by us when he was 11 years old. The animal rescue charity (Waggy Tails) had done a great job taking care of him after his first mummy passed away, but he was quite creaky and unfit. He could only cope with short walks and could not jump or manage stairs. A friend recommended Cortaflex. After being on Cortaflex for a couple of months we saw a great improvement. He certainly got more out of life after finding out he could jump onto the sofa for cuddles. Continued benefits to his mobility were evidenced by his ability to walk up a flight of stairs and jump into bed with us on colder nights! Do the words rod and back come to mind? 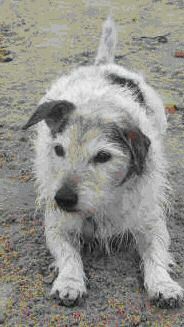 Here he is on his 14th birthday, still with plenty of energy after a good half hour walk to the beach. 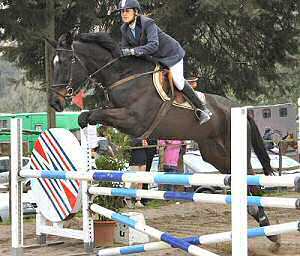 My name is Anna Paola and one year ago my horse (Uraniam) begun to have backache. We descovered a serious arthritis problem and my veterinariam said that probably my horse wouldn't be able to jump again as before. Fortunatelly after a long therapy together with Cortaflex we resolved all problems, in fact, we are succesfully participating in jumping competitions again. Careless Whisper was my large Show Hack and, produced for the show ring by Stuart and Nigel Hollings, he was one of the most successful large Show Hacks of the late 1980’s. 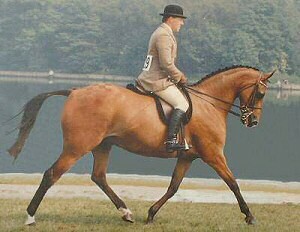 At age 14 years after a check ligament injury, I retired him from showing and started doing Dressage. I then began to notice that he was showing signs of getting older... he had lost some of his suspension and elevation and was generally "stiffening up". I saw an advert for Cortaflex in the Horse and Hound and ordered a tub. Within a very short time he was back to his old self - showing off and REALLY moving... he seemed to have found his second childhood! I kept him on Cortaflex and went on to have great fun and success in Dressage - it was like I got my "old boy" back. The Cortaflex is doing wonders for my 10 year old dog - and he has only been on it approx 10 days! He has a lot more energy and is walking a hundred times better! Just thought I'd let you know Cortaflex has been invaluable in keeping my 27 yo gelding going - even after a tendon injury when he was laid off for a year. He's still competing (and winning) at dressage on a regular basis. Ta!! "Many thanks! The Cortaflex is doing wonders for my aged Spaniel!" ...you may like to know how we are getting on with using Cortaflex. Although it did seem to take quite some time before we could tell a difference, we are now absolutely delighted with the results on our Labrador, and my father and I have been using the human cortaflex with amazing results also - its like I have new knees! I keep seeing your ads. in Horse and Hound etc, about succes stories regarding Cortaflex. We've also got one! Four years ago I came to work in a hunt yard, we have a twenty year old Huntsman's horse who we were about to give away to a retirement home. One of your reps. came and sold me Cortaflex for another horse. I decided to try it on the old horse. Within two weeks something was happening! I noticed he didn't have to have his usual 15 minutes 'walking on pins' because he was too stiff to walk out. We don't have to listen to his joints creaking when he's being shod or having his feet picked out. For the last two seasons our Huntsman has described him as not only his best horse but his strongest horse. He carries the horn twice a week in some of the most deepest, wettest country you could possibly imagine. Now you wouldn't think twice about pointing him at a gate or a good hedge and ditch. Even the day after hunting there isn't the stiffness and soreness that even the younger horses get. I can see all 14 of them having Cortaflex next season. Old Black Jack (who is actually brown now) has had a new lease of life thanks to your product. Thank you Cortaflex !! I stumbled across your web site, and have been taking the capsule form of Cortaflex since its begining. I am glad that it is only a memory and not the actual pain of having to walk down the stairs backwards, to minimize the knee discomfort. Now I don't give a second thought to going up or down stairs, and that at aged 60. Cortaflex "plays" in Peoria (an old vaudevillian term). In case you get any queries about the effectiveness of Cortaflex, my Labrador is now getting on for 12 years old. At 4 years old a vet told us to have him put down as his hips were so bad, either that or risk a bilateral excision arthroplasty. We decided to explore alternative solutions. 8 years later and he's still going strong on Cortaflex and hasn't even had an operation! "Bella is almost back to her former self ... she appears to be happier than ever, several of our neighbours have commented on this and I have recommended Cortaflex to other dog owners... "
"I ordered Cortaflex for a friend's Welsh Cob mare and we could see the difference within the first week!" We would just like to say how pleased we are with Cortaflex. Our 13 year old cat started to limp last year and was stiff after sitting/laying in the same position for a period of time. We had been giving him a powdered form of glucosamine which did not relieve his syptoms. After trying Cortaflex... we don't want Rocky to be without it. Thank you so much for sending me the second tub of equine Cortaflex so promptly. It is indeed working well. One of my 3 ponies is a handsome, thirteen-year-old Dales gelding by the name of Duke. When he became stiff last year he was turned away to rest, and did not improve enough to be ridden. Recently he began to spend more time lying down in his stable and field and was reluctant to walk much at all. He was obviously getting worse. My vet suggested that we give Cortaflex a try. Six weeks ago we did! Duke is now zooming around his field as he used to do, bucking with sheer joy, and showing off his wonderful Dales trot again after nearly twelve months of imitating a snail. Another success for Cortaflex. Just had to let you know. Please do place Duke's story on your testimonials page. He has the maintenance level each day and has taken to racing right around the perimeter of his paddock, ending up with some jumps that have all four feet off the ground at once! He's so surprised at what he can do. He hasn't been ridden for around eighteen months, but I've now had a couple of short sessions recently and he was just fine about it. Cortaflex is a an amazing product of which I cannot speak too highly. After all, it's given me my lovely Dales pony back to ride again. "I am the ultimate sceptic so when my wife produced a bottle of Cortaflex I backed off and did nothing for two months. However, my joint pain, which had been steadily increasing over the years, became so bad that I agreed to try her special medicine. I am totally amazed by the results. I took it on Saturday evening and by Sunday morning there was 100% improvement. This has steadily progressed so that my general joints are now almost out of pain. As a professional man, I am unable to explain the speed of action, but it certainly is true and it is my intention to carry on with the medication." I purchased 60 Cortaflex Capsules on the 21/07/06, which I stated taking on the 01/08/06, 2 a day for eight days and then one a day thereafter, the relief in my damaged knees is unbelievable and I have recommended Cortaflex to other people. Just wanted to say that the service that we get from you is INCREDIBLE! My horse... sorry wife, has suffered with knee problems for several years now and has been talking tablets. Her physio in Henley-on-Thames told her to use Cortiflex and - due to the wrong spelling they could not find the source. As I am an internet "freak" I soon found the incorrect spelling... Cortaflex... ordered from you in December and my wife is feeling the benefits already. She placed an internet order with you at 10.39am on Saturday 12th Jan and it arrived at 8.00am Monday 14th. Amazing. Thanks and regards, Les and Janice King. PS. One of our friends jokingly said that my wife may start naying when we told them it was horse medicine! I replied saying that I was hoping it would get her back on all fours !!! I really feared that I would have to retire him. But now we can both continue to enjoy the sport that we have done in combination for the last 14 years. "We use Cortaflex on our racehorses with great success. We then tried the dog version on Henrietta's stiff old Labrador and were absolutely amazed at the difference. In no time at all the Labrador was jumping in and out of the car again." "I take Cortaflex every morning and am certainly feeling the benefits." "My old gun dog, who has been very active for most of his life, began getting stiff back legs. We tried him on Canine Cortaflex on the recommendation of a friend who gave it to her own geriatric dog. I was a little sceptical that a food supplement could help but after about three weeks on Cortaflex solution his stiffness disappeared and now he is virtually back to normal. It has definately made a big difference for my Labrador and he will stay on Cortaflex solution until he dies." We would be interested to hear of your success with Cortaflex. Simply email us and attach a photograph of your horse/dog/cat - even yourself! - we would love to feature your success story on this page. If you have a website, we will even add a link to it.